Open Innovation 2.0 Conference took place on 23-24 May 2016, on Royal Tropical Institute, Amsterdam, Netherlands. More than 300 people attended the event to exchange information around the following action-oriented themes: Open Innovation 2.0 and Digital Single Market, ePlatforms, Data-Driven Innovation, Urban Agenda, Future Cities, Living Labs and Business Challenges. TAGES was also there to talk about the open innovation project they are a partner of: OPENISME (Open Innovation for Innovative SMEs). Open Innovation as Henry Chesbrough on his book “Open Innovation: The New Imperative for Creating and Profiting from Technology” (2003) talks about is an important component of the foreseen European Innovation System, where all stakeholders need to be involved and create seamless interaction and mash-up for ideas in innovation ecosystems. Open Innovation 2.0 is a new paradigm where government, industry, academia and civil participants work together to create the future and drive structural changes far beyond the scope of what any one organization or person could do alone. The event started with the keynote speech by Henry Chesbrough, who talked about the open innovation ecosystem and why open innovation is important to the companies as well as governments and the innovation paradox and what should organizations do to be well off with the help of open innovation 2.0. 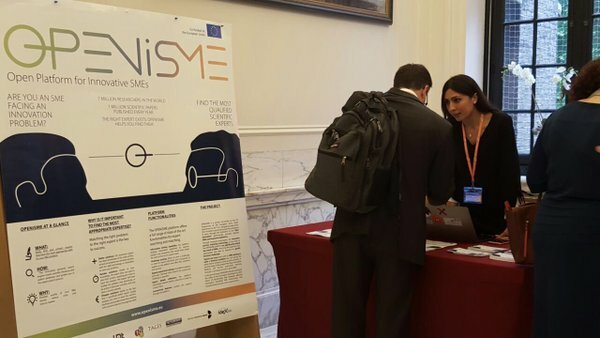 Leyla Arsan, TAGES CEO, and Aslıhan Kağnıcı, TAGES Projects Consultant attended the event and spoke to the attendees one by one to promote OPENISME (Open Innovation for Innovative SMEs www.openisme.eu ) Platform and to explain how can they utilise the platform. Many of the participants joined the platform and stated OPENISME platform is a great platform for SMEs to reach the latest publications and patents on their expertise fast.